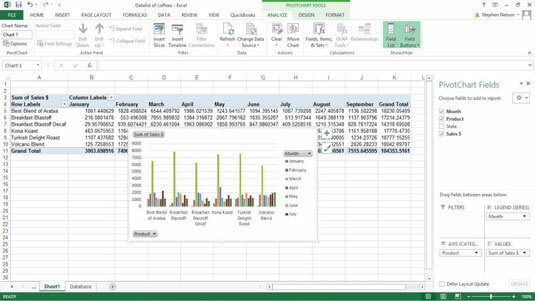 You can use Excel’s standard charting commands to create charts of pivot table data. You might choose to use the Charts toolbar on the Insert tab when you’ve already created a pivot table and now want to use that data in a chart. Select the worksheet range in the pivot table that you want to chart. Tell Excel to create a pivot chart by choosing the appropriate charting command from the Insert tab. The Chart Wizard creates a pivot chart that matches your pivot table. Take a look at this column chart created from the Excel worksheet that summarizes sales from your imaginary coffee business. A pivot table was created for the data and then told Excel to put the pivot table’s data into a column chart. For normal charting, by the way, you set up a worksheet with the data that you want to plot in a chart. Then you select the data and tell Excel to plot the data in a chart by choosing one of the Insert tab’s chart commands. Excel offers you many ways that you can customize your pivot chart.